While the 1 Astro B·yond 2 TV mission has fulfilled my mom's desire of watching her favorite AOD channels in living hall and bedroom, I have not spoilt myself for able to watch sport channels on my big screen, and most important in HD. Getting a solution for sharing SD content is easily achievable and affordable with widely available tools. But it's opposite for HD content (at least in BullehLand here), and it usually costs a bomb if you manage to source one. Perhaps many in Malaysia still regard such thing as "rich man's hobby" and markup the price, but in actual it's not that expensive if you do a little homework before taking out your wallet. HDMI switcher and HDMI splitter. As its name suggests, a switcher is to switch between multiple HDMI sources to be displayed on X number of screens. A 4x1 HDMI switch is a switch that is capable of switching between 4 different HDMI sources and output to a single display. 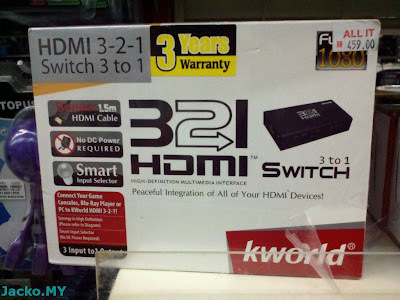 This is useful if your TV has only limited HDMI inputs, say only 2 HDMI inputs but you have Astro Byond satellite TV, Unifi IPTV and a Bluray player. On the other hand, a splitter is to split (or clone) 1 HDMI source to X number of similar sources. For instance, 1x2 is a 1 to 2 splitter where you get 2 display connections from the splitter. Splitter is useful if you want to watch the same content on different displays, this is exactly what I wanted to accomplish - split the Astro Byond source to 2 displays over a short distance. However, I am very skeptical to such products, whether the manufacturers submitted the products for HDMI certification or do they produce the products according to the HDMI specifications? 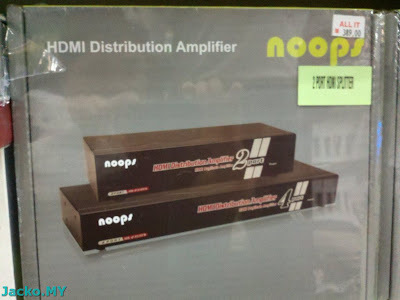 You would hit into problem such as no sound, distorted display etc especially Bluray that requires high bandwidth, means high quality of cable and all interconnection that are compliance with HDMI specifications. The Abtus 1x2 splitter. I thought this model should be compliance (of HDMI specification) after a visit to their website, unfortunately a high price tag of RM600 caused me to hold my decision and survey further. The brite-View Air SyncHD with a USD$230 tag. Looks promising but reading through the reviews changed my impression on the product. 19 out of 58 reviews rated 1 and 2 star, that is > 30% of dissatisfaction. Well some could be due to user problem but I rather not to take any risk especially it would be hassle for me to get a refund. Probably the company has found the flaw and improved with the new 2011 edition. Worth a try. Look identical to brite-View Air SyncHD right? But indeed it's a different brand, look more like a rebadge. That's the Giraffe™ WAVE by a local company PCOM. I called up the company and was offered a free personalized installation and liability free if the device doesn't work for my setup. I must say I am impressed with the service, it's extinct to get such a good service from a local company but the price tag really turned me down. Would you willingly be slaughtered for RM1899 for a toy when you knew it only cost USD$230 or RM700? Not me! Nonetheless, it seems to be a good product. I would recommend you go for a try if the price is not a matter to you. Anyway price is only one of the factors, I am not buying in the idea of transmitting HD content wirelessly at this point of time. IMHO, the technology is still developing and there are many variations, WHDI, WirelessHD and Wireless Gigabit. Probably it's just like HD DVD vs Bluray in the past few years, we as consumer just have to wait to spectate who wins the war.